Ben and Jerry’s have all the answers, not only delicious ice cream but now we can all sleep easy knowing that no-one else can get their hands our favourite dessert. 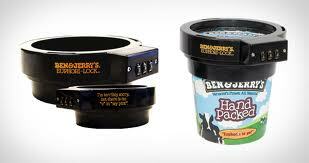 Introducing the Ben and Jerry’s Euphori-Lock. An ingenious gadget that puts a clamp on the lid of that precious dessert!